Jai Jai Jagannath sacīra nandan tribhūvana kore jār caraṇa vandan. A French sailor was coming to Pondichery from Calcutta by his ship through the eastern coast of India and was bringing a big bell from a port of France to the church of Pondicherry . The ship was moving parallel from the shore of the Bay of Bengal and proceeding through the parts of Chandipur, Paradip in Odisha . People belonging to France and England were in that ship. His assistant suddenly saw a giant whale big enough to swallow the whole ship. He was scared and could not speak . His voice was choked as he saw that the ship was heading directly towards the creature. The sailor was taking a reading of the ship’s course from the chart in the control room. Hearing the call, he rushed out, a little perplexed. “What is the problem?” he inquired. The speechless assistant pointed his finger towards the huge whale. The captain observed the approaching whale with his binoculars carefully . There was also an impending storm on the horizon. The winds were gusting and tearing at the sails. The captain first thought of releasing the lifeboats from the ship. But could these small boats even reach the shore in such high windy situation . He thought it will lead to more deaths . The ship left two months ago from France and he knew all the passengers by name The captain realized the gravity of the situation, but was haunted by a sense of helplessness. Huge waves continued making the sea turbid and black. The more he observed the approaching danger, the more frightened he became. He had no idea what course of action to take immediately . He decided the only thing to do was ring the warning-bell. He shouted to the crew to look out for themselves. There was no way to avert this imminent disaster. The Captain was running about the ship frantically. All the frightened passengers encircled him. Any hope to save even lady passengers was thin. He was an experienced captain, having spent a good part of his age at sea. Yet now he was completely bewildered. Tears ran down the captain’s cheek, and the little baby began to cry along with its mother. The captain was helpless and had no way to console them. The shadow of death loomed large, a transition between life and death about to be violently enacted. Some were crying, while others were taking half-measures to save their lives. Only a few moments remained before the unavoidable end. Utterly confused , he cautioned everybody in the ship to adopt precautions for their lives at their own responsibility. His anxiety made him run all around the ship . He could see one man was sitting quietly and was relaxed . The captain went close to him .A midst the turbulence ,he was looking at a picture of his worship able Lord and keeping it close to his heart, whispering something to himself. His mind was totally fixed on that picture. The Captain recollected … Oh this is the old man who had boarded the ship at the last port in India . The captain rushed past him many times, still he was hardly noticed. The ship was about to be battered by the storm. The Captain ran to the upper deck of the ship and snatched the binoculars from a deck hand so he himself could see their approaching fate. “ Oh dear God, we are so close to that deadly whale! What a harrowing sight!” He was seeing death itself approaching steadily. Now only the touch of death remained to be felt. Totally dejected and with a sense of deep despair he walked away cursing his fate . He again caught sight of the old man, sitting still a midst all the fright and confusion very relaxed . With curiosity he bent over to see the picture, which the old man held. It was a hand drawn painting, with three Deities sitting close to each other (Deity of Lord Jagannath, Baladeva & Subhadra). “What are you doing?”shouted the captain at the old man . The old man was in a prayer mood and was shaken . He looked at the captain………………………………… Each eye was adorned with a tear. “I am praying to Lord Jagannatha to rescue us from this catastrophe,” he said quietly. “ Jagannatha? Who Jaggantha …..
What can He do for us? Can He kill the whale with a weapon ? Can He save the ship?” retorted the captain. A trace of a smile came over the old man’s face. He appeared so calm and composed at that moment of crisis. “ Lord Jagannatha is my only resort. Any danger is dispelled if one prays to Him,” the old man said passionately. “He makes a human response. Hey ….. said the captain . “ Can He save our ship from the clutches of death?” in disbelief. “ He will do the needful, that is His work.” ……Replied the man simply. Can He act as a controlling force over nature?”asked the captain. If He can save this ship, I will offer Him all the treasures on board the ship and myself as well.” thundered the captain …. The old man smiled and returned to his praying. The captain rushed to the upper deck of the ship again, and to his greatest surprise he saw the whale change its direction! The whale’s forward movement was slowing down and slowly he veered out to deep sea.The more the captain observed this, the more his face filled with amazement. But the ship never stopped tossing about from the onslaught of the storm. ‘ One danger is removed, but still there is another with its own fury,’ thought the captain. It seemed the ship might be wrecked within a minute’s time. A huge thunderclap was heard and a bolt of lightning flashed across the sky, so powerful that it seemed as if the whole world would be destroyed. The captain rushed to the old man’s side and embraced him tightly. The old man was still doing his prayers before the picture of Lord Jagannatha. “The Lord of the universe has answered our prayers,” he said simply. A benign smile appeared on the old man’s tired and time worn face. Tears filled the captains eyes and his voice choked. “ No one is foreign to your Lord Jagannatha. The old man replied …….He is Lord of the Universe and he will reach to the one who surrenders ..
All joined the old man’s prayers . Captain ran to the upper deck to observe whether any shore was visible in sight. The top of a huge temple, looking like a Blue Mountain, was clearly visible. His assistant overjoyed said . This french bell can be seen in the old courtyard near to the original office of the Puri Jagganath temple . very gripping and beautiful indeed! Jai Shri Krishna! Jai Baladev!!! Jai Subhadra Devi!!! Thank you Varadhan Swamin for enlightening us about Lord Jagannath of Puri and his endless compassion. To be frank, I haven’t heard of this incident/story in my entire life of 79 years! பூரண சரணாகதிக்கு நிகர் ஏது. அவனருளாலே அவன்தாள் பணிவதல்லால் வேறு கதியும் உண்டோ. இந்த ஸம்ஸார ஸாகரத்தில் உள்ள பல திமிங்கலங்களை அவனல்லவோ விரட்டமுடியும். “The panic mood of the travellers was converted to Heavenly BLISS” – When shall Adiyen reach this stage? A mother asked to save her child at her cost! Oh Lord Jagannatha! save my son’s family in their journey at my cost! Jai Jai Jaganntha…. When you are ever with me, why shoud I worry? Thanking you Varadan, may be you are sent by Udayavar in unfolding Adiyen’s journey – thorny – still – Kurai onrum illai! Aiyen – Ramanuja Dasan – Jai Sriman Narayana! Kooresa ..The most advanced srivaishnava ..
"Oh ! 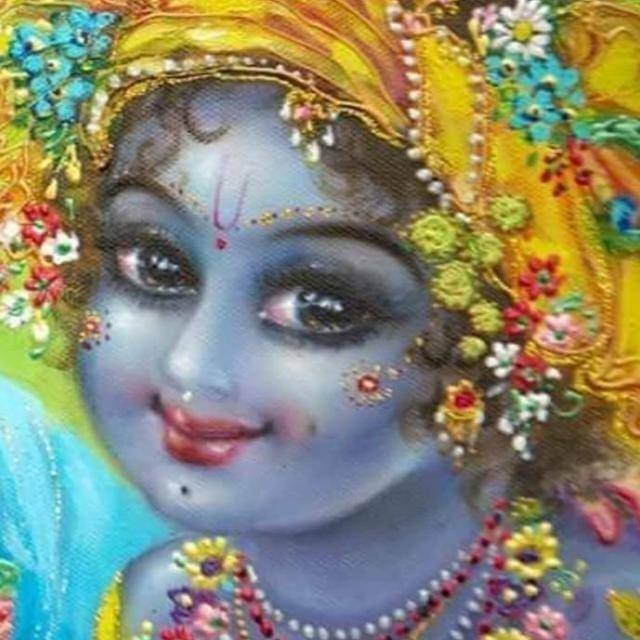 Lord Krishna, now at this moment let the royal swan of my mind enter the tangled stems of your lotus feet .. Prana-prayana-samaye kapha-vata-pittaih. 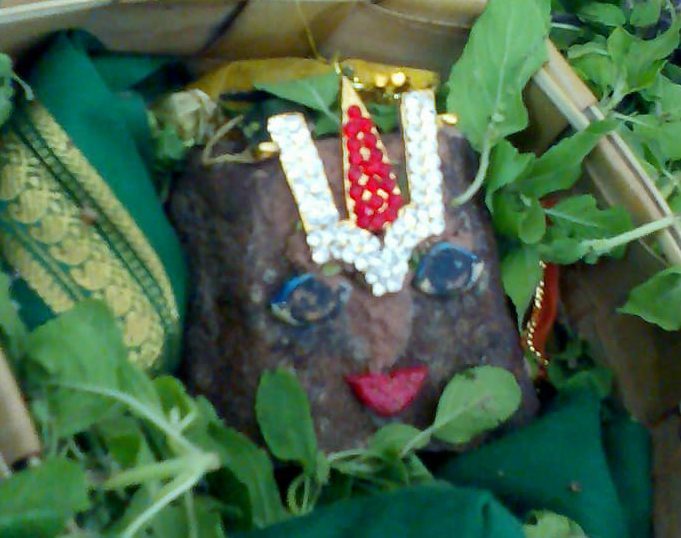 kanthavarodhana-vidhau smaranam kutas tey. WHO IS A SRIVAISHNAVA ? give me a word in which I can take refuge".